One of the biggest growth areas in recent years for anyone touring has been mobile internet access. There are a couple of ways of accessing the internet… you can either go the ‘dongle’ route and connect via the mobile phone network or you can go the WiFi route and rely on a growing trend for places to install WiFi hotspots that you can connect to. 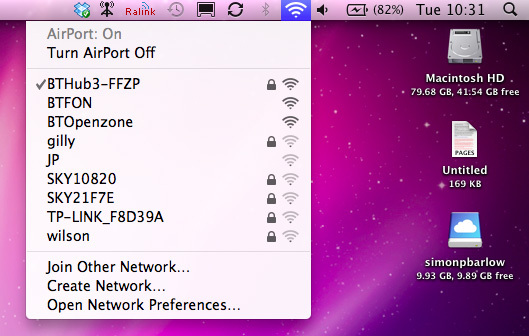 Almost all Laptops now come with inbuilt WiFi access, but there are limitations. The WiFi unit is often compromised by being built down to a cost and the fact the antenna has to be integrated in to the body of the device. I use Mac’s exclusively and from one of the Mac forums I was put on to a product called ‘Bear Extender n3‘. It was originally designed by students at Berkley California to enable them to connect reliably and over a further distance with the University’s WiFi network called “AirBears” The unit its self is only tiny and connects to your laptop via a standard USB lead. I have tried it with a 5 metre long USB lead and it works fine. 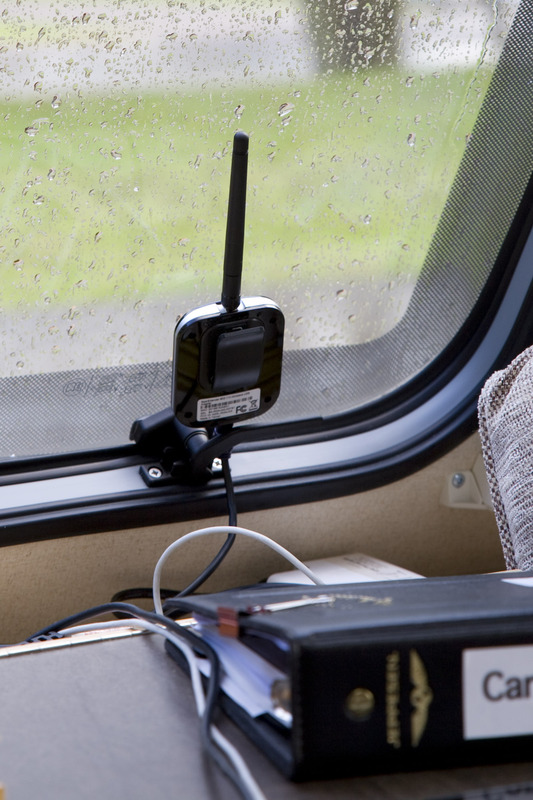 This allows me to position it inside the caravan for the best signal. Out and about, the unit is small enough to clip to the screen of your laptop and power consumption is low so it will not drain your battery. One key point though is the antenna is removable and can be replaced with a higher gain version. 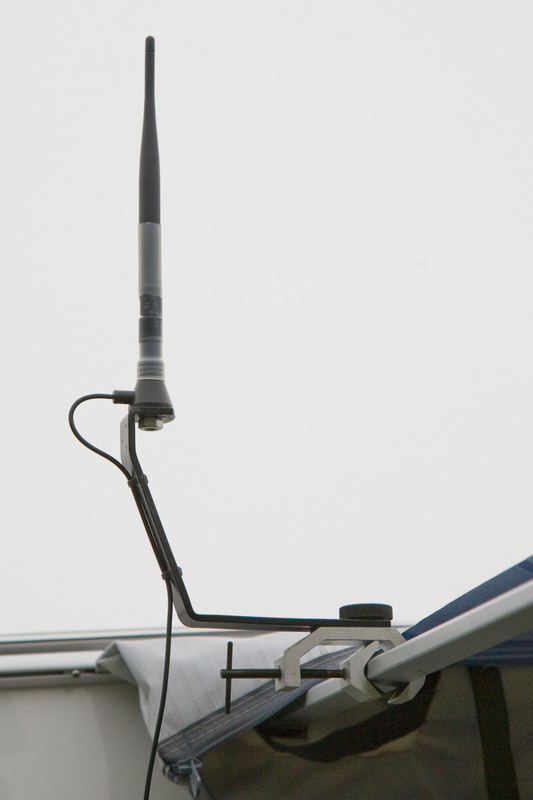 The antenna that comes with it is has a 2db gain but as Bear Extender uses an industry standard RP-SMA antenna port it allows you the flexibility to upgrade to a larger antenna in the future. They do offer a 5db gain areal and there are 18db gain aerials available. 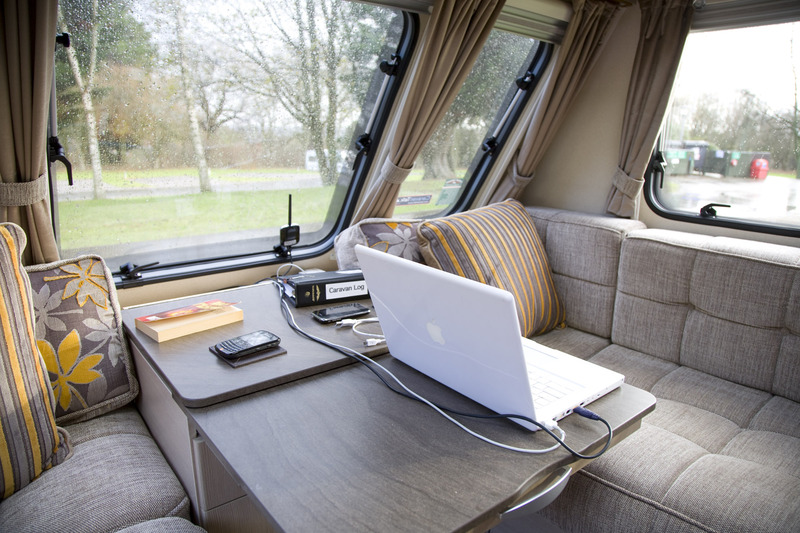 As the RP-SMA connector is standard, you can buy extension leads and remote aerials… I bought a remote magnetic mount aerial on a 2 metre lead from Maplin as I wanted to be able to mount the aerial external to the caravan for the best possible signal reception. Using it is fairly straightforward. On both a Mac or PC, you install the software that comes on a handy USB memory stick, so if you have a net book or an iPad that doesn’t have a CD-ROM drive, it’s not a problem. (It is always worth checking on the website that you have the latest version of the software). On a Mac, the software installs without any problems, all you need to do then is turn off AirPort and plug Bear Extender into any USB port. I have used the Bear Extender now on a number of trips and I have always been able to get a signal. Usually I have been able to connect to a BT FON point or a BT Openzone connection rather than use any of the site WiFi connections. When using the CC or C & CC networks, I’ve always got a good connection. To show the difference, here are a couple of screen shots taken on my laptop when it is sat on the desk at home. 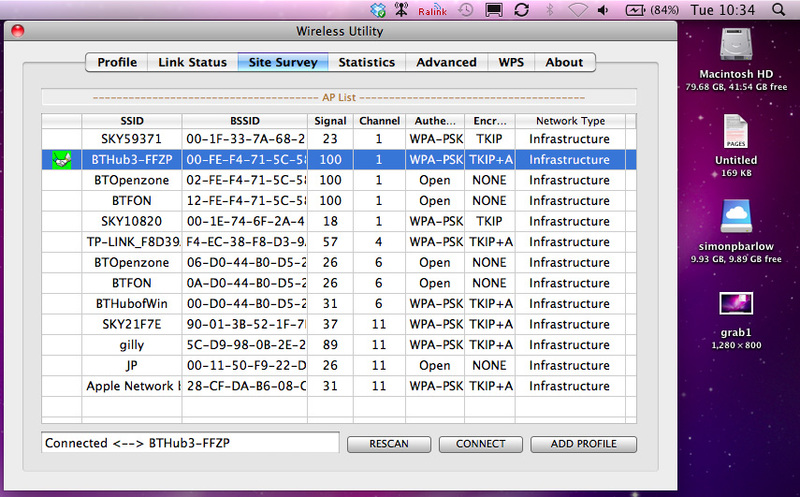 The first is using the inbuilt Apple card… it could detect 9 WiFi networks around me…. The second shot is connecting using the Bear Extender… it could pickup 13 WiFi signals… even at a signal strength down to 23, it would connect. As I mentioned earlier, for use in the caravan, I wanted to be able to locate the antenna outside the van to improve the quality and strength of the signal. I originally purchased a hi-gain magnetic mount antenna from Maplin, and I’ve built a mount that allows me to fasten it to the rail on our Fiamma Caravanstor awning so that it is just above the roofline of the caravan. At marginal locations this makes a huge improvement. It’s not perfect and I’m looking to develop something that will allow me to clip it to an awning rail. (update… I have now made a mount to allow me to fit it to the awning rail). Although the Bear Extender is an American product, it is available here in the UK from Moving WiFi and is available for Mac and PC’s. I bought my Bear Extender from them and they were really efficient and offered an excellent service. They also have a few other interesting gadgets for mobile connectivity. Is it worth the money? – For me, YES. Thank you for the information, I am looking to buy the same set up as you now. Please can you tell me where you bought the -18dB Aerial from? It was a standard item listed at Maplins…. I’m not sure if they still do them though. It might be worth doing a search “mag mount 18db wifi aerial” to see what comes up. I think it is a standard SMA fitting from memory. I am afraid it doesn’t work with Macs running Yosemite or El Capitan. Check the Bear Extender web site. The original article I wrote over two years ago now and I haven’t upgraded my Macbook to the new operating systems so wasn’t aware of an problems. I’ll check out the web site though. I suspect though there are better units out there and I’ll be doing a revisit soon seeing what’s available. I found the Bear Extender an excellent product so was disappointed when it stopped working after I upgraded the OS to Yosemite.. I have been looking for a replacement system. 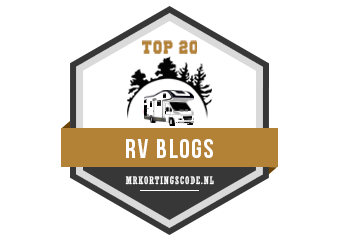 The iBoost Pro D8 Directional System (http://www.motorhomewifi.com) seems to get a good following though you can source the same kit at http://linitx.com considerably cheaper. I look forward to your follow up posts on this topic. I would like to put a link into this article on Caravan Talk for an index that I am compiling. If this is acceptable, can you give me a bell please. PS will give you a call.